SSO 2019 will host the most distinguished and influential cancer surgeons and other oncology health care professionals from around the world in San Diego, California from March 27-30, 2019. The SSO Annual Cancer Symposium provides an outstanding opportunity to engage with 1,800+ attendees who are among your target audience and eager to experience first-hand interaction with the latest, most advanced medical equipment, services, and solutions. 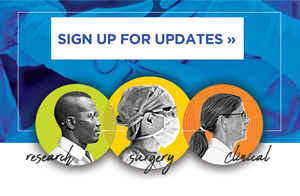 Connect with an international group of surgical oncologists, holding primary responsibility for establishing the diagnosis and staging of cancer who use the products and services your company provides. Capitalize on an intimate opportunity to engage with influential surgeons, with a rare physician to exhibiting company ratio of 19 to 1. Reach physicians early in their careers and new to the profession. More than 30% of attendees are Fellows and Residents. Benefit from over six dedicated exhibit hours within the overall agenda and all food and break functions scheduled in the Exhibit Hall. Gain access to 1,800 surgical oncologists and oncology health care professionals outside of the practice setting. Strengthen your existing connections and expand your sales pipeline. Passport Game – Attendees will circulate throughout the exhibit hall, securing stamps from exhibitors to enter a prize drawing. Fellows & Residents Lounge – Giving fellows and residents yet another reason to visit the exhibit hall and enjoy a private area to share ideas, discuss best practices, and take a few moments for themselves. Exhibit Hall Theater – Programming will include SSO late breaking videos, highlighted poster abstract presentations and exhibitor presentations/product theaters. the Exhibit Hall Happy Hour. All food and complimentary beverages will be provided by participating exhbiitors to be served directly from their exhibit space. Select your food and beverage pairing. Don’t miss out on this great opportunity to connect with the top minds in surgical oncology and introduce your products and services. Reserve your SSO 2019 exhibit space today to be a part of the leading international scientific event for surgical oncologists!